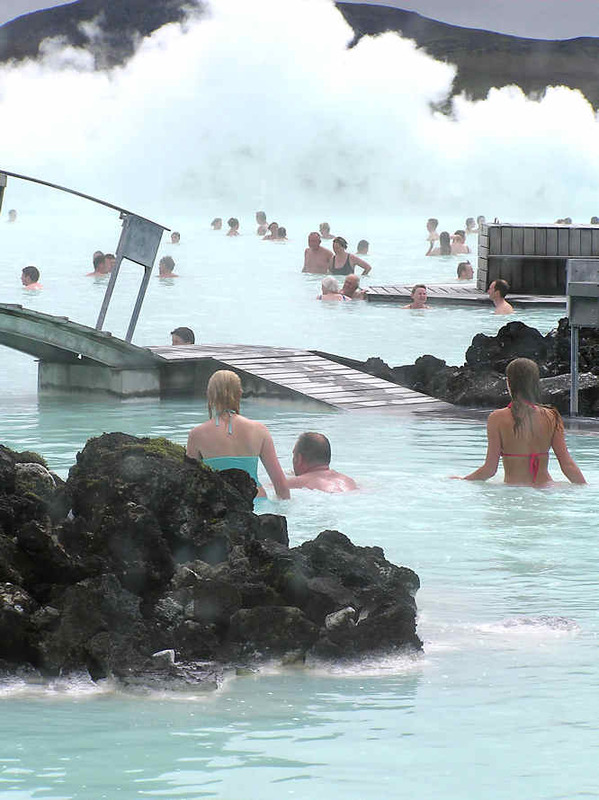 The Blue Lagoon is likely the most popular tourist attraction in Iceland. It is near the Keflavik airport about 20 minutes outside Reykjavik. If you have to change planes and have a four hour wait get a taxi and indulge yourself in this spa. The nearby Svartsengi power station is run on superheated water; The water is forced down a hole in the earths surface towards the hot magma and then rushes back up as a superheated jet of steam which is used to drive turbine fans that produce cheap clean electricity. The mineral rich clean hot water is deposited in nearby man made pools in the old lava flows. The water has chemically interacted with the volcanic rocks to produce silica mud. They sell this stuff in pots for $60US as a beauty treatment mud pack. Whatever the weather outside, relax in the naturally hot water pools of the lagoon. The nearer you get to the centre of the pool the hotter the water becomes. Find the right location and temperature to suit you and drift away in this giant blue bath. The cost may seem a bit high but it is so worth it. You get a locker and towel. Remember to pack your swimming costume. They have a very clever chip system on the bracelet you get when you pay your entrance money, you can even get yourself a beer without having to carry your wallet around. Instead, you pay on the way out. You can now get relatively cheap air flights tickets on budget airlines to Reykjavik Iceland. 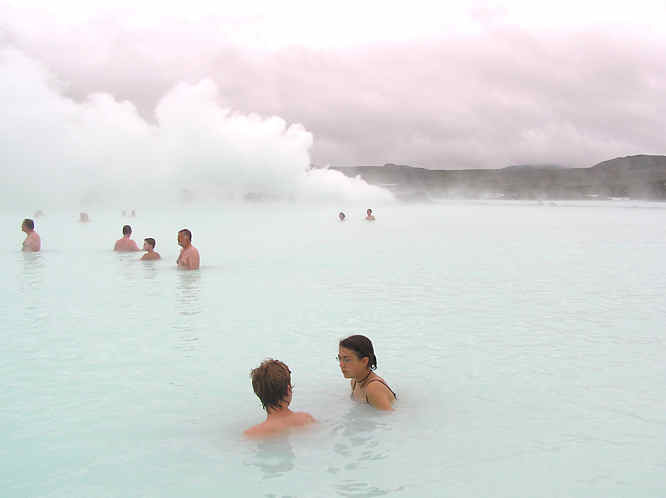 You can also visit Iceland as a stop over venue when travelling to New York using Icelandic Air. The country is one of then most dramatic places to visit on earth but it is a very expensive place to visit. Accommodation is nearly five times more expensive than other tourist locations. The price of meals shown on the menus of some of the Reykjavik restaurants may seem like a misprint. You have to pay 3 or 4 times as much for an item as you would do in Northern Europe. Everything has to be shipped or flown in. This is the main reason why everything is so expensive. Supermarket prices as slightly cheaper but can still be twice as expensive as European prices. Transportation is also expensive so if you can hire a car at the airport car rental outlets it is a good move as it is the most cost effective way to get around the country. The most interesting things in Iceland- the landscape, the waterfalls etc are free. Remember in summer that there is no night. And in Winter there is no day. The summer average high temperature is 14° C. It can be very windy and frequently wet so bring some warm waterproof windproof clothing and sensible shoes. Walkers have died from exposure in June. Nearly all Icelanders speak English. You will see unusual rock formations in various sizes stacked up in piles in the lava fields. The Icelanders believe their country is populated by hidden races of small people such as trolls and elves. The local folk law traditions say some of these odd rock formations were actually trolls that were caught at sunrise doing something evil and were therefore turned into stone.